How many Trello cards and boards are you a member of? For many of you, the answer is… a whole lot! When you work on multiple projects or with multiple teams, keeping up with all your boards can become overwhelming, to say the least. You may find yourself constantly jumping from board to board, and sometimes forgetting what board has which card. The Unito Power-Up operates under the assumption that no Trello board should be an island. Collaboration works better when it crosses the boundaries of boards, and even tools. 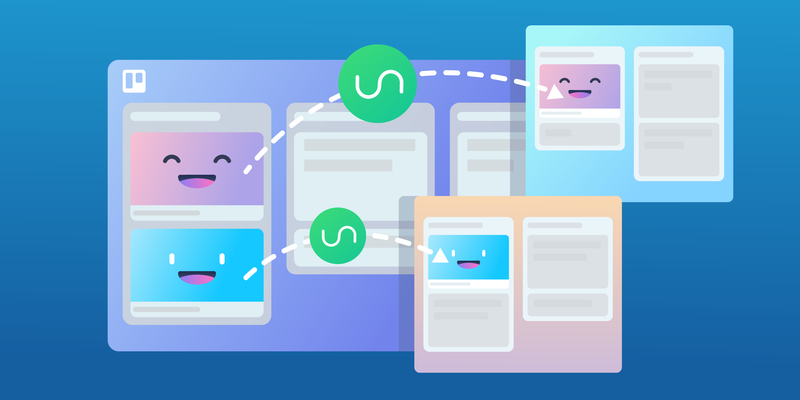 That’s why Unito is a great way to sync (connect) information between Trello boards, letting your cards exist in more than one place at the same time. The Unito Power-Up lets you sync data such as descriptions, labels, lists, checklists, Custom Fields, comments, due dates, members, attachments, and more. Teams receive real-time updates on what’s happening in multiple boards — without ever having to leave their own. The best part: You can control exactly what information gets synced by using the filters. Ready to take a look at a few of the cool things you can do with Unito’s Power-Up? Let’s get started. When two teams work together on the same project, but each have their own board, a lot of information overlap can happen. Although cards can be easily moved, copied, or linked, they stay completely isolated in their own boards. As a result, updates made to cards in one board may get missed by those in another. The Unito Power-Up solves this problem by syncing Trello boards. Any updates (such as moving cards to other lists, adding comments, or adding members) made in one board, will automatically get reflected over to the other. Think of a sync as a mirror between cards: It reflects the details between them! 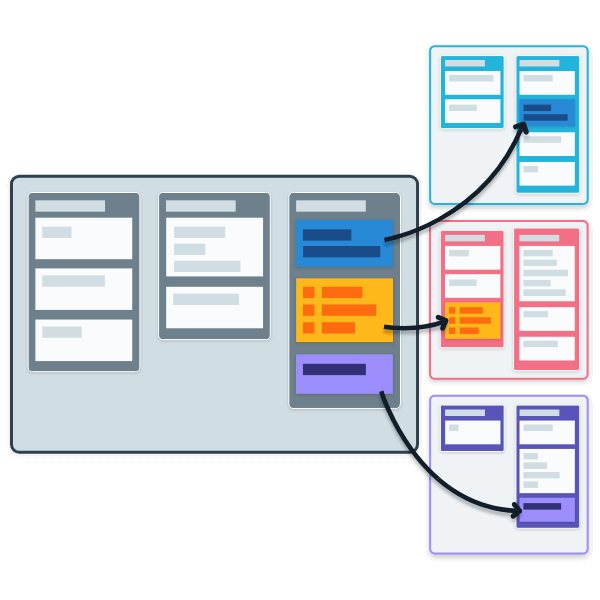 By using filters and mapping features, you can control which cards get synced between boards, and how the workflows between them are matched. Tracking data from multiple boards isn’t easy, and neither is having to constantly open, close, and switch between them daily (or hourly 😱). The Trello world could really benefit from a way to centralize cards into one place. How does it work? You simply sync cards from several boards into any one board of your choice. For example, you could have a central board that contains all the cards on which you’re a member! You can then work out of that central board while Unito automatically updates it with any new cards as you get added. The centralizing powers of Unito can be used for many other purposes, such as building an Executive Overview board. Any cards (from any boards) deemed necessary for executive review could be given a specific label or added to a specific list (called ‘For Review,’ for example). Unito will then sync any cards with that label or in that list to the Executive Overview board. This board will contain only those cards for managers to oversee, sparing the need to track them down or manually copy them from other boards. Centralizing information is great, but you can also dispatch cards from a central project board to other “satellite” boards. For example, say you’re managing a website relaunch project that involves collaboration from various teams like content, graphic design, and development. Rather than having to open and close each of those team’s individual boards in order to assign tasks and monitor progress, you can simply sync them up with your master board. You can then create tasks right in your board, and have them automatically synced over to each team’s board. Yeah, it’s magical. How does this work? Simply label cards with “dev,” “content,” or “graphics.” Any cards with a “dev” label will automatically pop up in the development board. Different teams have different workflows and unique board setups. For example, a sales team may have lists like Qualified Leads and Paying Customers. 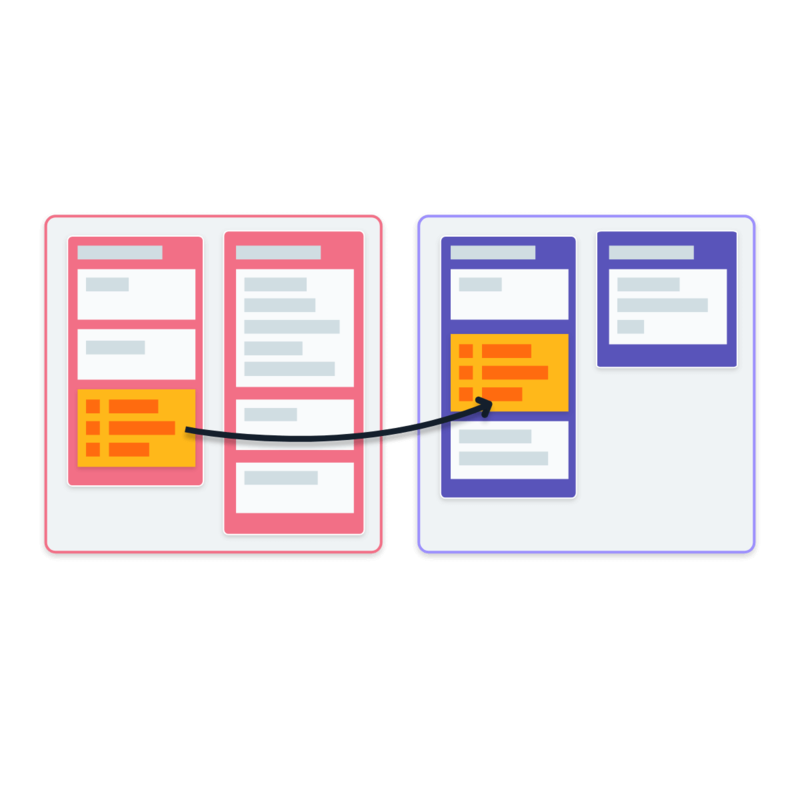 A development team may organize their tasks into a more standard kanban system – To Do, Doing, and Done. But what happens when they have to work together and their boards aren’t organized the same way? 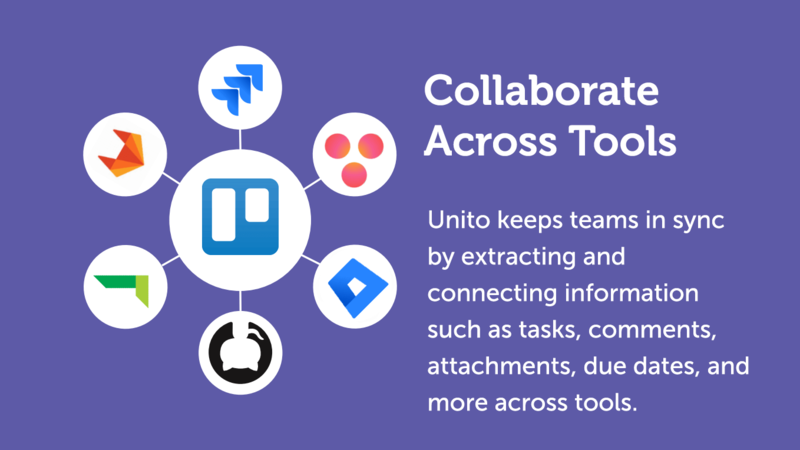 Unito lets teams collaborate without changing anything about their individual board setups. By using the Mapping feature, teams can choose which lists to match up. So back to our example, the sales team could delegate customer support tasks from their Paying Customers list directly to the development team’s To Do! Teams within a company, or even within a project, don’t always use the same tools. For example, a lot of developers prefer to work out of Jira or GitHub. In today’s “there’s an app for everything” reality, sometimes it’s better to embrace diversity in software rather than fight it. 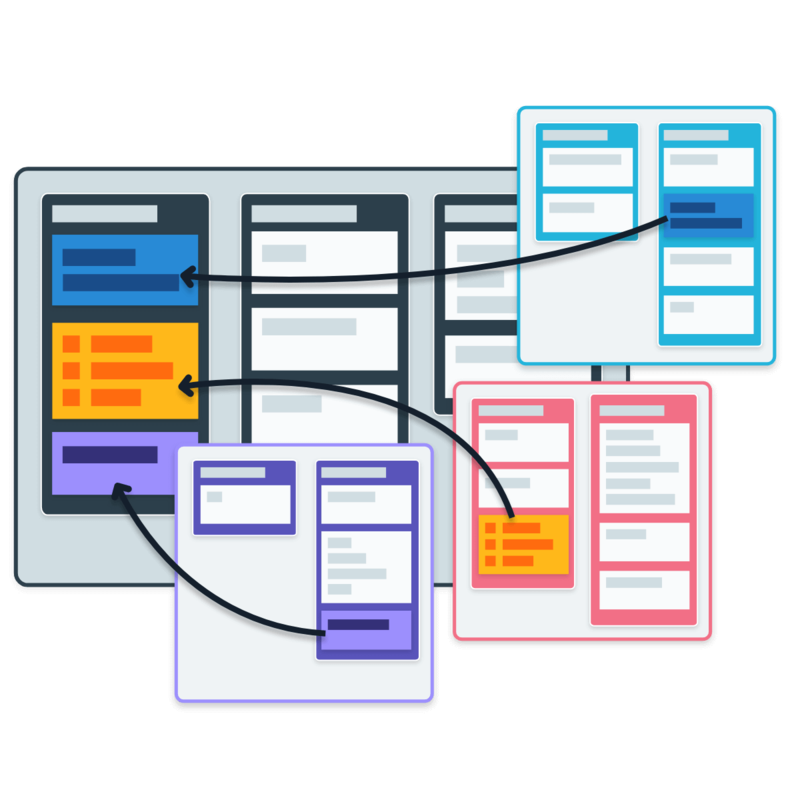 Here’s the good news: Everything we covered in this article, you can do not only between Trello boards, but between boards in Trello and projects in many other tools. Is every team in your project using a different tool? You don’t have to open and close multiple tabs to keep track of progress everywhere. Just sync up the projects and you’re good to go! In addition to Trello, Unito currently syncs Jira, Basecamp, Wrike, GitHub, GitLab, Bitbucket, and Asana. More are on the way! Simply click on the Power-Up directory in the board menu. Type Unito into the search bar and you’ll see a set of results for several Unito syncing options. Do you want to sync boards within Trello only? Choose Board Sync. 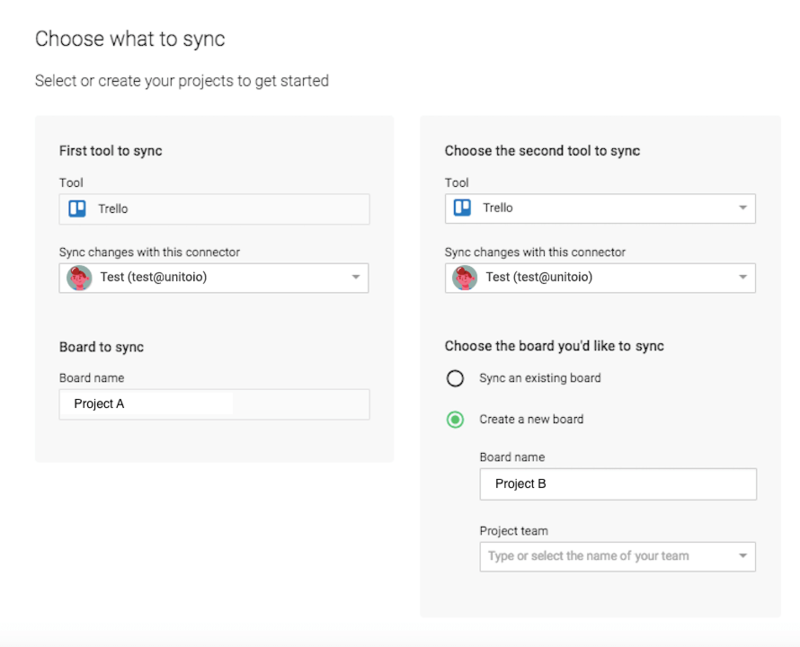 Interested in syncing Trello boards with projects in other tools? Click on the option with the relevant tool. Once you’ve chosen on an option, click Add. Next, head back to your board. Click on the power-up button in the top-right corner, and simply follow the instructions on screen to connect your Trello account to Unito. That’s it! Now you can start building your syncs! For more information and step-by-step guides on how to get your ideal sync setup, check out the Unito knowledge base, or simply get in touch with our friendly customer success team. They’ll be glad to guide you through each step of the process. The examples in this article are just a few of the things you’ll be able to accomplish with Unito. Be sure to test out the 14-day full-featured free trial to see for yourself. Interested in learning more about Unito’s Pricing Plans? Read up on their Personal, Team, Business, and Enterprise options here.